When small businesses neglect creating official budgets, they risk issues with long-term planning and surprise expenses. 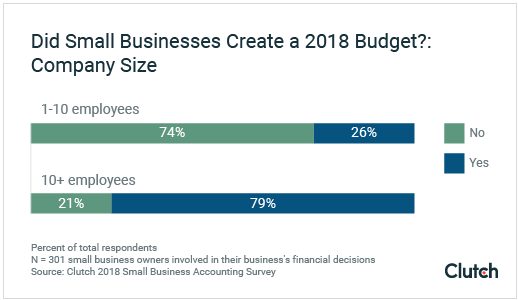 We gathered survey data that reveals why small businesses forgo budgeting, plus tips for how small businesses should create their first budget. Small business owners face a number of challenges everyday with their accounting, but creating a budget can help mitigate them. Budgets provide guidance for short-term obstacles and long-term planning. Yet, many small businesses aren’t creating budgets, according to our three-part small business accounting survey series. We found that businesses of all sizes should create a budget or risk the financial health of their business. Nearly two-thirds of small businesses (61%) did not create an official, formally documented budget for 2018. Smaller businesses are more likely to skip making a budget. Nearly three-quarters of small businesses with 1 to 10 employees (74%) did not create an official budget, compared to only 21% of small businesses with more than 10 employees. 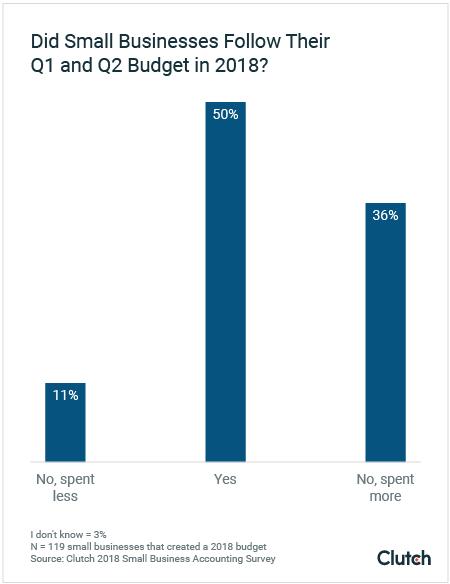 Among small businesses that created a budget, more than one-third (37%) spent more than they budgeted in Q1 and Q2 2018. One in five businesses that budget (20%) plan to increase their budget in 2019. Many small businesses do not create an official, formally documented budget, even though they can benefit from budgeting – especially as they grow larger. We found that more than 60% of small businesses operated without an official budget for 2018. Rhett Molitor is the co-founder of Basis 365 Accounting, a cloud-based accounting service. He says he’s seen small businesses forgo budgets because creating one seems restrictive. These small business owners may see a budget as something that will limit their business’s growth by tying them down to a rigid structure. “You don’t really want to hold yourself accountable to anything because that’s what you’re trying to escape,” Molitor said. In fact, these businesses may create more challenges for themselves by skipping a budget. This is because budgeting helps small businesses focus. “Having a budget keeps everyone working toward the same goals and helps scale your business,” said Wanda Medina, co-founder and CEO at Maventri, a full-service digital firm providing accounting, marketing, and administrative support services. Without a budget it's difficult to determine what your challenges are and how quickly you need to fix them before running out of financial resources. Budgets ease the process of monitoring finances and making decisions. When teams are misaligned on their goals, miscommunication can arise and limit long-term planning. Donna Conte, service area leader for accounting services at Warren Averett, a full-service accounting and advisory firm, agrees that budgeting improves long-term planning. Overall, small business owners may be shortchanging their businesses’ potential by skipping a budget. The larger a business is, the more likely it is to have a budget. Among businesses with 1 to 10 employees, nearly three-fourths (74%) did not create a 2018 budget. By comparison, only 21% of small businesses with more than 10 employees did not create a 2018 budget. The smallest businesses may be able to get by without a budget, even if a budget could benefit them. When a business only has a handful of employees, it’s easier to keep an eye on everything, reducing the need for the outside accountability of a budget. As a business grows, though, a budget provides vital direction. In fact, we found that the largest percentage of small businesses listed “unforeseen expenses” as their top financial challenge. These unforeseen expenses could potentially have been avoided with a budget. Yet, a budget cannot account for every cost that comes up during a financial period. An essential part of budgeting is allowing some wiggle room. “Allow for a little flexibility in your budget, because too much rigidity is impractical and will not allow for unforeseen circumstances,” said David Ambrogio, consultant for Tower Books, a small business bookkeeping and consulting firm. A smartly planned budget can help small businesses navigate unexpected financial obstacles. Among small businesses that budget, many plan to spend more in 2019. 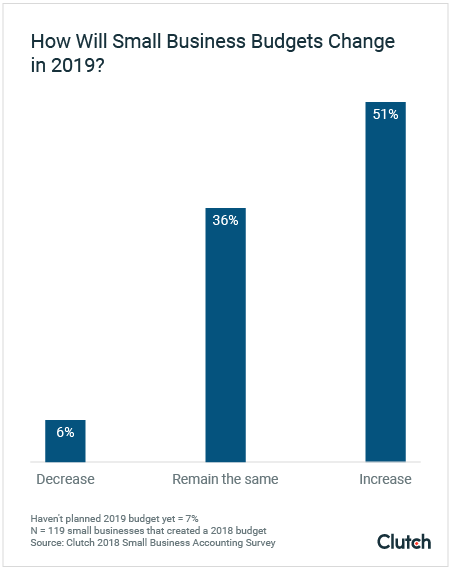 More than half of small businesses (51%) say that their 2019 budget will be larger than their 2018 budget. This may signify healthy growth for the businesses. However, small businesses must ensure their new budgets are based on comprehensive information and critical analysis – not simply the profit they hope to earn. You should base each year’s budget on goals that you hope to reach during the budgeting period. Harvard Business Review recommends brainstorming 3-5 goals. Your budget then becomes a plan for how to fund those goals. Caitlin Worm, Managing Director of Blackbird Philanthropy Advisors, a philanthropy consulting firm, recommends keeping your goals focused and emphasizing growth goals, rather than spending plans. Small businesses’ budgets must be based on realistic goals and concrete data and should set up your business for success in the new period. Small business owners may fear that sticking to a budget is impossible, given the day-to-day obstacles of running a business. Yet, our data suggests that small businesses can keep to a budget. Exactly half of small businesses that created a 2018 budget say they spent about what they budgeted for in the first and second quarter of 2018. More than one-third (36%), however, spent more than they budgeted. How Can Small Businesses Stick to a Budget? Several small business owners offered their recommendations, including setting goals and regularly reviewing finances. Small businesses can stick to their budgets by keeping an eye on their original goals. You can focus on those goals by reviewing your finances regularly. For example, Matt Ross, COO of RIZKNOWS and The Slumber Yard, two e-commerce websites, recommends looking over your financial performance every month. This allows you to stay ahead of any potential budgetary disasters. David J. Campanella, senior vice president and market leader for U.S. Bank Private Wealth Management, a bank holding company, also suggests that small businesses think critically about how they record finances. He said small businesses must think of their budgets in terms of cash flow. Instead, these small businesses should budget for their payments when they are actually due. It isn’t hard for small businesses to stick to a budget if they plan thoughtfully and review regularly. While some small businesses can get along fine without a budget, there are cases when this decision leads to trouble. For Shawn Breyer, owner of Breyer Home Buyers, a lack of budgeting nearly sunk his home renovation company. Breyer’s company didn’t carefully watch its cash flow – and the cash ran out. He ended up needing to find a private lender to finish the project. Budgeting provides peace of mind. Rick McCartney, CEO of iRewardHealth, opened up behavioral health clinic with several business partners. They signed a long-term building lease, assuming most of the clients from his and his partners’ private practices would transfer to the clinic. When they did not, the business ran into serious trouble. Once McCartney’s clinic started budgeting, they found problems areas and started implementing changes, including finding a new location and streamlining offered services. Now, the clinic makes a profit, allowing them to start paying back the debt from operating at a loss for over a year. Often, the need for a budget doesn’t present itself until a business is in trouble. Consider creating one from the beginning. Many small businesses don’t create budgets, even when they could benefit from them. Our survey found that nearly two-thirds of small businesses did not create an official, formally documented budget for 2018. Smaller businesses, with less than 10 employees, are more likely to skip a budget. While 50% of small businesses that created a budget say they stuck to their first and second quarter 2018 goals, over one-third said they spent more than they intended in the first half of the year. Small businesses can stick to a budget by keeping an eye on their original goals and reviewing their finances regularly. Lastly, small business budgets are growing, with 20% of small businesses saying their budget in 2019 will increase. All small businesses should carefully consider creating a budget to maximize their chance of financial success. Clutch surveyed 302 small business owners or managers who are involved or very involved in their business’s financial decisions. Small businesses are defined as those with 500 or fewer employees. Fifty-eight percent (58%) are female and 42% are male. Sixty percent (60%) of respondents have owned or managed a small business for 5 years or more; 17% for 3-4 years; 13% for 1-2 years; 10% for less than 1 year.